Ahead of the EFW teams visit to The Camrose this Saturday, we took time out to interview the Director and (and!) General Manager of the club Dave Partridge, who was good enough to spare a few minutes of his time. 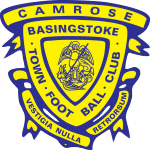 What's the best thing about supporting Basingstoke Town? Good friendly warm club. Great friends. Great people. And the worst? When the wind blows straight down the ground on those cold winter nights! What has made you laugh in your time of following BTFC? There are plenty of laughs in the office during the day; you need a good, if slightly off the wall! sense of humour to run a football club! Are the club on a sound financial footing? Is any? We are probably in a better position than most as we believe in not spending beyond our means, and we are actively working at practicing that belief. Many clubs are now beginning to experience the effects of doing the opposite. What sort of welcome can us Lewes fans expect at The Camrose? A very warm welcome. The fans here enjoy a pint and a chat before and after the match and even at half time if you are quick! Lewes fans will even be lucky and get in for a fiver! (special promotion for this game). We like a beer with our football here at EFW, what is the clubhouse like at the ground? Decent size, should be something to suit most people and food on matchdays. Big Screen TV and a friendly atmosphere. Can get busy on matchdays and reasonable prices for this part of the world. A Quick look through Wikipedia tells us that singer-songwriter Tinita Tikaram now resides in Basingstoke. Presumably, The Dragons trot out onto the pitch with the sounds of "Good Tradition" echoing around the stadium? Strangely no, but they have run out to the “Camrose Strut”. This was a chart single released by a local songwriter in 1997 for the FA cup run that spanned 11 games losing to Northampton Town in the second round replay. Anything else we should know about the club? You asked about “Stoke” or “Dragons”. The “Dragons” nickname came about in the 2006/7 season and was intended to give the club a stronger image – it gave the press a lot of “fire”power in the amazing cup run of that season. In tandem with this, our mascot Stokie the Dragon arrived, a very popular addition to the squad for our younger fans. Finally, can you sum up BTFC in a Tweet of less than 140 characters? A family orientated club that is trying to move forward, raise its profile and reach out to its wider community. Never a dull moment here! (An impressive 138 characters, best of the season - Ed). The EFW Team will be rolling into Basingstoke just before midday for our usual Saturday fix of darts, beers and football. As Dave mentioned, it's only 5GBP to get in on Saturday so, what are you waiting for!? See you there. *No Stepping Back = The BTFC motto.